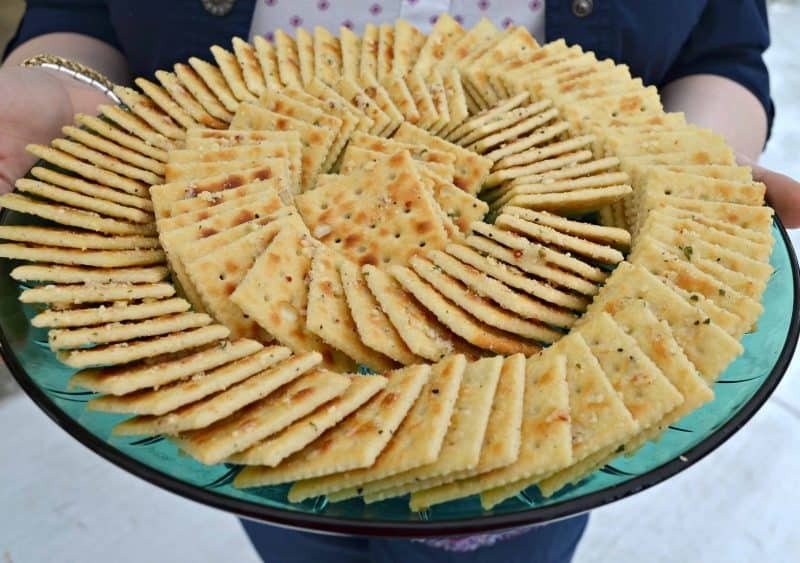 Aunt Looney’s Easy Peasy Party Crackers are always the life of the party! Party Crackers are the stuff of legends among old school crowds in the South. Boutiques have jars of them on the counter, bags of special recipes are gifted at holidays, trays are featured at bridal showers and sporting events, and private recipes are written and rewritten over and over as they are passed around in kitchens and church meetings. 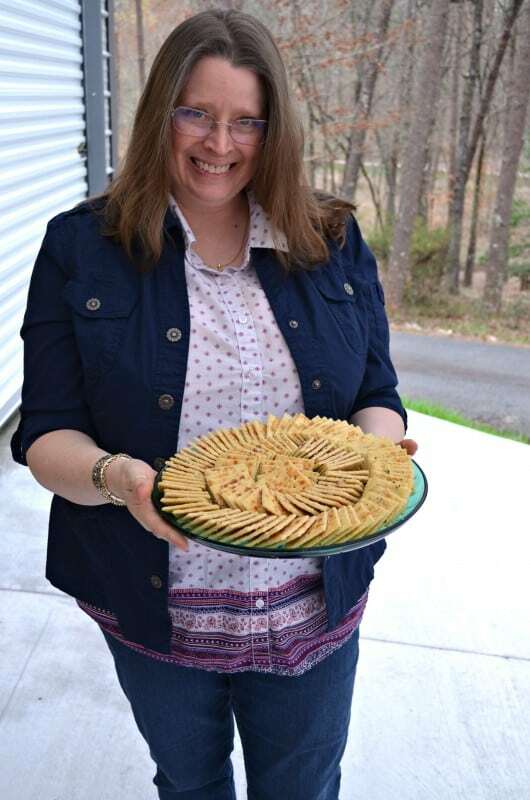 If you’ve never tasted what I’m talking about, you may think my sister in law is holding a tray of plain old saltines in that picture, but once you try this recipe, you’ll know that Tina is actually holding the most popular tray at the party. This is the one that everybody is going to head to and clean off first. Today we’re still coming back from what I am referring to as “the bubonic flu” at our house, so I’m taking this opportunity to share Tina’s recipe. Tina is also referred to as “Aunt Looney” in my cookbooks. She is Katy’s favorite aunt in the universe because she is always fun, crazy in the best ways, and just a hoot to be around. The instructions are simple so I’m just sharing those along with the final photos of Aunt Looney :). Make these for your next get together – or just to snack on around the house, and get ready for one of the best tasting crackers that’s ever passed your lips! Line crackers on their sides (Edges, like they were in the sleeve) in rows of a plastic dish with a tight fitting lid (These Rubbermaid Takealongs are perfect). Don't worry if they won't all fit, just put as many as you can. Pour oil in a 1 pint canning jar. Add dressing mixes and Parmesan cheese. Screw on lid and shake jar well. Slowly pour all of the mix over each row of crackers. Put on casserole lid and flip it over. Let sit for 5 minutes. Flip the casserole back over and let sit for 5 minutes. Repeat every 5 minutes for 1 hour and they are ready to serve. Store, tightly sealed, up to one week if there are any left over. *The Fantastic 7* Summer Barbecue Sides! Ive made firecracker crackers, using the canola, Italian dressing and red pepper flakes, they are addictive! This sounds great. How much of each. I love party crackers! I put mine in a 2 gallon zipper bag and gently shake to coat with the oil and spices. They sound really good . I was wondering about using club crackers . Most recipes I have you have to put in the oven . I won’t have to heat up my kitchen . Please post a picture of how to line up the crackers in the container. Thanks for helping them! I went back and added a little more in the directions so maybe that will help. I appreciate you covering for me though! Thanks. You always haves pics with step by step. But not with this. Thanks. hey girl I have heard of these! They look yummy! At our house, we call them Cajun crackers. I use the oil, tbsp. Garlic powder, teasp.cayenne. So good with gumbo. And just by themselves. They get so crunchy. I have found a great big wide mouthed jar. I think held mayonnaise. I just put the crackers in the jar,pour the oil mixture over them, put the lid on and set it on its side on the counter. Everybody who walks by gives it a roll, and they all get covered that way. I leave them out all day. This jar method works better than any other way i have found. Does not crush the crackers, and after a day they feel perfectly dry. Take them out and put in either a tin or plastic container with lid.. I have had these before – they are so good. A friend of mine makes them and she adds red pepper flakes to give them a bit of a kick. Thanks for sharing the recipe. So…you don’t need to put in oven? And they don’t get soggy? Thank you Christy! Just came home from Kroeger and will get busy! I made it to Kroger today, too! Felt like a big achievement ;). I even cooked supper. It was good to have an actual meal after all this time. Poor Ricky can’t boil water. No, thdy get unbelieveably crisp and crunchy. Believe me. I have made these thirty or forty years. Can these be frozen if you have leftovers? Hey Pam, you don’t have to freeze them, they will keep for several weeks just in a ziplock bag. I also make a variation of these, but prefer to use the mini crackers or oyster crackers so you can eat them like popcorn. I also bake them like you would Chex Mix for extra crispiness! I use a $1 aluminum roasting pan from the dollar store to mix up a huge batch and then just throw the pan away! Easy clean up! How many ounces or bags of oyster crackers did you use? Oh my goodness I bet you have stories to tell Missy!! First for me hearing about these crackers……..Thanks sounds good. I hope you get the chance to try them soon Elizabeth! Oooh I love these things! If I make them I eat WAAAAy to many of them. Christy I think I have been spending too much time on your site. I dreamed last night that you told me I couldn’t have any banana pudding until I finished making the bows to put in the chickens hair!! LOL!!!! I woke up laughing and my husband asked what the heck was I dreaming about?? HA!! Don’t you wonder about some of the dreams we have-they can be so funny!!! And the dream seemed so real!! I can still see Christy standing there, with that bowl of banana pudding in her hands shaking her head no at me because I didn’t have all the hair bows (chicken bows???) ready for the chickens. AND I WANTED THAT BANANA PUDDING BAD!!! LOL In fact all day long I’ve been thinking about banana pudding!! Because I avoid MSG and other unhealthy additives, I make my own dry Ranch dressing mix . These are so good! A twist to try-use Orville reddenbacher butter flavored popcorn oil instead of plain oil just another layer of yummy. Glad y’all are on the mend. So enjoy your blog. I make these with spicy ranch mix, red pepper flakes, and coconut oil. So good! I tumble the crackers, oil, and spices around in a ziploc bag to coat them well. I like to use saltines or oyster crackers. We used to use saltines but have switched to club crackers and they taste so creamy. We use 1 cup of vegetable oil, 1 package of ranch and 2 TBSP. red pepper flakes. They are spicy but oh so good. Homemade firecrackers are like these. I use olive oil and red pepper flakes. They are so, so good!!!!!!!! Can these be made with less-than-fresh saltines? I’ve some that’s just beginning to stale on me, and rather than throw them out…. Or must they be fresh for best results? Dale, I’d for sure try it on your soon to be stale crackers… can’t hurt. But yes, I’m sure they’re better using fresh crackers. They will be better using fresh crackers, but will work on yours that are going stale. Christy, I hope you and your family all feel better soon. Please tell Aunt Looney thanks for the recipe!! And incidentally, I had an Uncle Looney but he’s been gone for many years now. As a child he made me laugh so thanks for the reminder! I can’t eat pop corn.. but hating missing out on Carmel corn.. or flavored corn. organic cheese powder. or Italion seasoning.. or carmel topping. so glad to have this recipe too . This might sound weird, but what do you serve with these ?? I mean, I can’t just make a plate of crackers– can I ?? What ‘other’ things go well with them, if I should want to serve them at a party, I will add !! Thanks so much. I enjoy you every time. Glad you’re feeling better. Setting them out all on their own is perfectly fine….. they won’t last long. We’ll be having a “tapas-style” (appetizer only) housewarming soon….. these will be on the table for sure! They are really good with slices of extra sharp cheddar. Of course, I think everything is good with slices of extra sharp cheddar! I like the way you think Lacey!! Chrissy, thanks so much for posting even when you’re feeling poorly. I hope you and yours are right as rain by the time you read this comment! Thank you Quinn, we are getting there! If you use oyster crackers, how many ounces or bags? The amount of oil makes me wonder what the proportion should be. I took a batch of these to our Mother’s Day family dinner and they were a hit. I ate a good amount of them myself. Thank you to Aunt Looney for the easy and affordable party snacks! I am from the northern states. When I moved down south I went to a church gathering I thought it was kinda odd for southerners to bring a plate of saltines to a pot luck. Just thought things are ” different ” down here . Was I surprised these seasoned saltine cracked are awsome just like the southern sweet tea, flakey buiscuits made from lard and southern twang. “Different” is always good down south! This reminds me of a funny thing. When my sister’s friend from Texas came to visit us in northern NY State one spring, we tried to give him rhubarb custard pie, a favorite of ours from an old family recipe. He refused to believe that a pie with “all that green stuff in it” would be any good! We laughed and laughed! Don’t you have rhubarb in the south?? haha! You know, I had never heard of rhubarb pie until college. One of my nutrition teachers was from the midwest and she mentioned it one night and ended up having to spend the rest of the class describing it and trying to convince us it was good! 🙂 To this day I’ve not had a chance to try it but I did see rhubarb in the grocery store the other day. Back when I was growing up, our produce availability tended to be more regional, and even them Southerners bought the foods they knew how to cook and looked at new things as if it were an alien of some sorts. Nowadays, it is amazing to see the variety of foods from all over the world in a little old grocery store in Huntsville, Alabama. With the onset of the internet, recipes and techniques are readily available to anyone so many more folks are eating outside of their cultural bubble. Even so, I still have never tried rhubarb pie. I would like an opportunity at some point, though! My mom used to make both rhubarb pie and strawberry rhubarb pie. The whole family loved both pies. Strawberry rhubarb was my favorite. So, if you do have a chance to try a rhubarb pie, be sure to taste both pies. I think they are very different from each other and both so good. I live in south and rhubarb pie has been around for a long time here. Its also has been made with rhubarb and strswberries, and grows in two of my friends’ gardens. Oh Christy, you simply must try a rhubarb custard pie, soo simple to make, rhubarb, sugar, flour and eggs, mix bake, LOVE. My favorite is definately plain rhubarb though rhubarb strawberry is much loved by many many people too. I like my strawberrys fresh. At any rate, frozen rhubarb is also available and would be easier to use for your first time pie, though it is easy to grow and you may find you want to grow your own after you try it. Good luck with trying it soon, let us know what you think. Thank you for all the information and tips Beth!!! These are delish!! I’ve made them using either the Hidden Valley Ranch Fiesta or Spicy Ranch favors. Ohhh, I need to find the spicy flavors!! OMG! I can’t believe how addictively delicious these crackers are. I used part whole wheat saltines and must say they are my favourite. I will definitely make these again. Unfortunately I live in Canada where we don’t sell the dressing mix but I cross the border 5 or 6 times a year and will definitely have this on my grocery list from now on. Thank you Christy for another great recipe. I am so glad you liked them Sandy!!! There are recipes on Pinterest to make your own Ranch Dressing powder/mix. I just made my 2nd batch of these crackers! They are simply awesome n they have to be better fo u then deep friend potato chips so I say if u wanna ear something crunchy n salty grab a baggie of these babies! Mmm!! Thanks so much for all your terrific recipes Christy!!! I am a huge fan of SOUTHERN PLATE in Lil ol West Virginia! U and your recipes seem to be a weekly discussion at our Local Bingo Hall! Lol..We all luv ur Stories along with the Best Food Ya Can Eat! Plz tell ur SIL Tina….In my recipe box n my daughter’s we have in Capital LETTERS….AUNT LOONEY’S CRACKERS! Oh my goodness, that is going to make Tina’s day!!!! 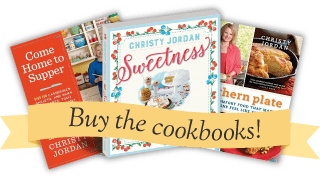 I am so glad you are enjoying the recipes and stories and am so grateful to have you and your daughter as a part of Southern Plate. Give all the ladies at Bingo a big hug from me and tell them I said good luck! !